Few companies have offered electric vehicles, with only a handful being sold or leased. These cars typically suffer from heavy battery weight, short range, and long charging times. The Honda Insight was the first gasoline-electric hybrid vehicle soldin the U.S. Hybrids offer the best of both worlds–ultra- low emissions and no refueling or range restrictions. Hybrids use an internal combustion engine to keep the battery charged, then utilizes the torque from an ultra-thin, permanent magnetic electric motorto get better performance from the small engine. 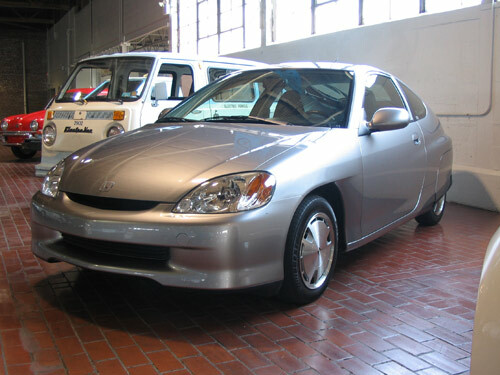 The insight’s eye-catching body style includes rear fenderskirts which help the air to glide past the rear wheel wells. This car also uses low friction tires, all in the interest of better fuel economy. Another means to achieve low air friction is the height of the car–it is a mere 53" high.